Shred the carrots and cabbage. Peel and mince the garlic. Mince the fresh ginger. Chop in small pieces the cleaned and deveined shrimps. Heat 1 tablespoon of oil in a wok until hot. Add the ground pork and cook until done. About 4 minutes. Add the shrimps and cook for another 2 minutes. Remove and set aside. Add the carrots, cabbage fresh garlic and ginger to the wok. Stir and add the brown sugar, Chinese rice wine, soy sauce, oyster sauce and rice vinegar. Cook over high heat until tender to the bite. Remove and let it cool off. Can be placed in the refrigerator for 10 minutes. 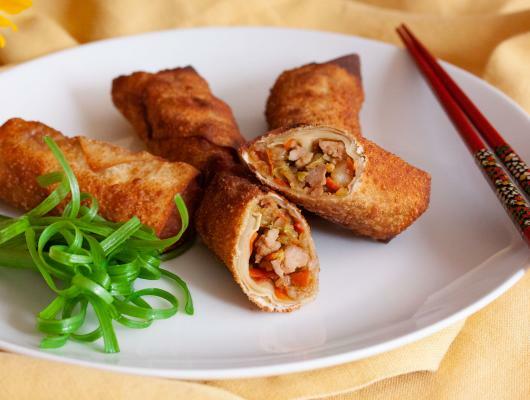 Place egg roll wrapper in a diamond shape on a clean dry surface. Spoon mixture in the lower mid part of wrapper. Cover with tip corner, fold side over tucking meat well inside, roll and wet triangle tip with water and seal. Continue with all rolls. Combine all the sauce ingredients in a bowl and mix well. Add more soy sauce as needed or desired. Sometimes it feels good to get out of the comfort zone and try new things. 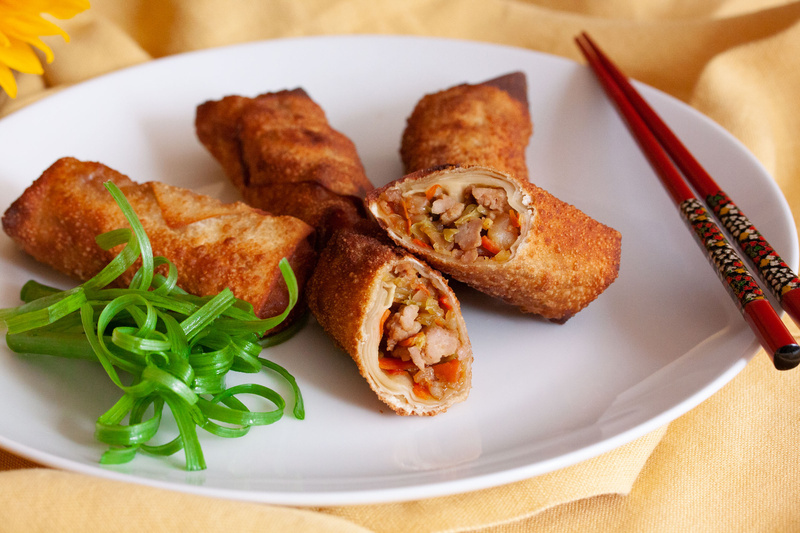 Egg rolls is a favorite of my family each time we go out to Asian food and yet I never attempted to prepare it at home. The opportunity presented itself thanks to Twin Dragon. Much easier than I expected to prepare and you can let your imagination do the cooking for you. The recipe below is my own creation and it is exactly for 20 rolls. Feel free to adjust the heat content by adding extra chilis in the sauce as well as in the filling. I like my heat to be in the mild side so I can enjoy every flavors bursting in my mouth with each bite.